He technically might be moving down, but Keston Hiura is actually going up. The Brewers told their top prospect Wednesday he will begin this season with Triple-A San Antonio. 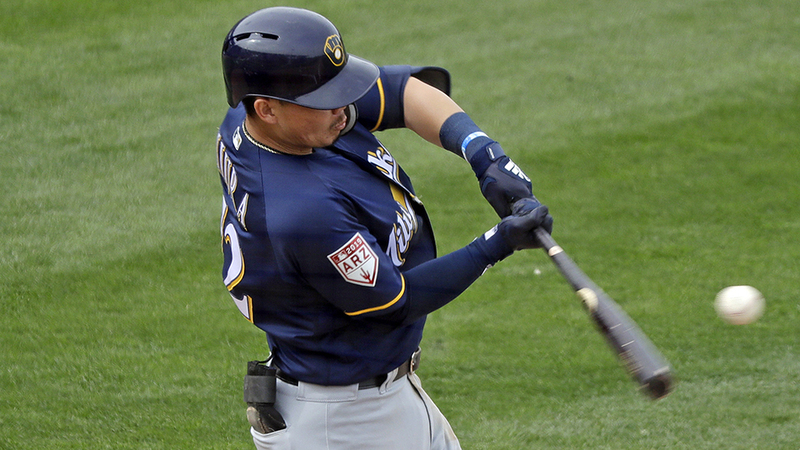 Hiura is still at Major League Spring Training in Arizona with Milwaukee, but he won't break camp with the club. The second baseman eventually will make his Triple-A debut once the campaign opens on April 4. Hiura sports a .263/.349/.553 slash line over 38 at-bats in Cactus League play. The No. 20 overall prospect is coming off his first full season in the Minors in 2018, when he started with Class A Advanced Carolina and hit .320 with a .911 OPS over 50 games. That prompted a promotion to Double-A Biloxi for the remainder of the season. The 2017 ninth overall Draft pick batted .272/.339/.416 with six long balls and 20 RBIs during his first -- and perhaps last -- foray into the Southern League. Expected to join Hiura in the Pacific Coast League is second-ranked Brewers prospect Corey Ray. He was told Wednesday he will not be on the Opening Day roster. Milwaukee's first-round selection the year prior to Hiura (fifth overall), utilized his combination of power and speed last year with Biloxi in a bounceback campaign. Ray smacked 27 jacks, 32 doubles and drove in 74 runs to produce a .801 OPS despite a .239 average, while fanning 176 times in 532 at-bats. The Louisville outfielder also swiped 37 bases. Brewers manager Craig Counsell said the team does not know where No. 8 prospect Lucas Erceg will begin the year, but he will start off in the Minors. The trio of prospects could participate in the big club's trip to Montreal for exhibition games next week, Counsell added. "I think they all had good camps. That was the message for all of them," the skipper told MLB.com. "They all received a lot of playing time. For all three of them, putting at-bats under their belts is one of the most important things in their development." Hiura wasn't the only top 25 prospect reassigned Wednesday. Although currently on the shelf with right shoulder soreness, Braves No. 1 Mike Soroka was optioned to Triple-A Gwinnett. The 24th overall prospect split last season between the Stripers and Atlanta, but made just 10 starts due to shoulder inflammation. Soroka has been sidelined since late February, but threw live batting practice over the weekend. "It felt good. It felt like it's been long overdue," the right-hander told MLB.com. "It's just nice to get back out there, face some hitters, even if there's a cage around it." Chris Bumbaca is a contributor to MiLB.com. Follow him on Twitter @BOOMbaca. This story was not subject to the approval of the National Association of Professional Baseball Leagues or its clubs.